Are you a thrill seeker? Or perhaps a storm chaser? Then I would like to talk to you about one of the most violent places in our solar system: Jupiter’s Great Red Spot. This enormous high pressure storm is similar to a hurricane on Earth, except that it’s huge. Immensely huge. In 2005, hurricane Katrina struck the coasts of Mississippi and Louisiana. It was one of the deadliest and costliest storms in U.S. history. The hurricane made landfall with wind speeds topping at 125 mph (201 km/h). When it hit land, Katrina was about 400 miles wide (644 km), and it raged for more than a week. It was horrifyingly impressive. But Katrina is nothing more than a light breeze compared to Jupiter’s massive storm. In the Great Red Spot, assuming that you aren’t instantly crushed by the pressure (you will be), you’re going to have quite a turbulent ride. Wind speeds around the edge of this beast reach over 250 mph (400 km/h). If you’re a wind surfer, this velocity might sound enticing. But consider your arms, legs, and head flailing about sporadically, flapping like a flag in the wind. Not so fun. Expect severe damage to your joints along with broken (probably pulverized) bones. And you won’t want to bring along a friend. Wind speeds of this magnitude accelerate matter to an alarming degree: all objects become deadly projectiles in the Great Red Spot, including people. And Jupiter’s giant is, in fact, a giant. The Great Red Spot is roughly 12,400 miles long and 7,500 miles wide (20,000 km by 12,000 km). So saying that you’ll be blown away by this storm is an understatement of epic proportions. Our entire planet would be blown away. Even at its smallest, this storm could easily swallow two to three Earths. And the clouds stink. Although most of the planet is composed of hydrogen and helium, Jupiter has clouds of frozen ammonia, some over 9 miles thick (15km). Ammonia gives off a rather pungent smell (similar to drying urine), so you might want to plug your nose. In fact, definitely plug your nose, because the ammonia levels are high enough to eat away your lungs. Of course, it will eat away your skin as well…and it will make you go blind. So I guess the smell will be the least of your concerns. On the plus side, there is magnificent lightening. Unfortunately, these bolts of are thousands of times brighter than the lightening on Earth. So if the ammonia doesn’t blind you, these bolts just might. Oh, and be sure to bring a coat. 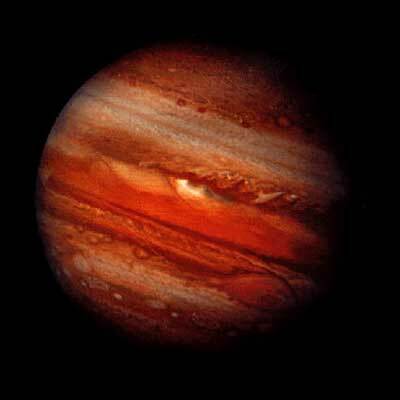 Temperatures in the Great Red Spot average a chilly -256 degrees Fahrenheit (-160 Celsius). As you probably know, “frostbite” occurs when your body fluids freeze in your skin. The frostbite danger zone begins at 32F (0C). Which means that the temperatures in the Great Red Spot will freeze you solid almost instantaneously. Well then, maybe bring two coats. Still not sure if this is the right vacation spot? Good news! The Great Red Spot is over 400 years old and has been continually observed since the 1800s; although its size fluctuates, it shows no sign of dissipating. So there’s no rush to make your travel plans. **Editor’s Note: NASA’s Juno spacecraft is scheduled to arrive in July of 2016 and will, hopefully, provide us with more information regarding the formation and structure of the planet. At which point, I may need to provide additional information regarding what your day will be like.